Ford has announced that its SYNC infotainment system will be getting a host of additional features this year. The SYNC 3 connectivity system – which replaces the relatively new SYNC 2 – will be adding Apple CarPlay, Android Auto, 4G LTE and several new AppLink apps to its repertoire. 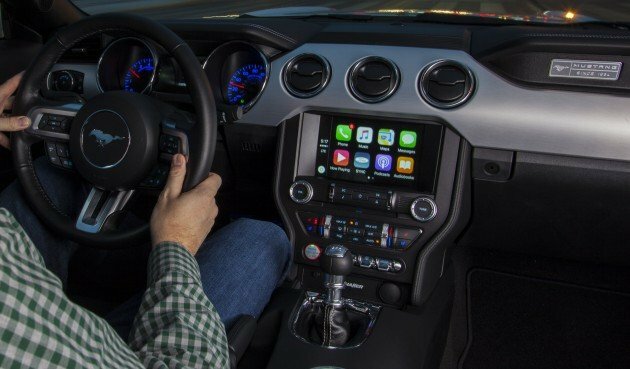 Apple CarPlay will give iPhone users access to Maps, Messages, Phone and Music through Siri voice control or touchscreen, while Android Auto will enables easier and safer access to Google voice search, Google Maps, Google Play Music and more via steering wheel controls and touchscreen. In addition, new SYNC Connect technology powered by 4G LTE will give owners the ability to remotely access features of their car – they’ll be able to facilitate a remote start, unlock doors, check fuel level or locate a parked vehicle via their smartphone. As for AppLink, the first apps using available vehicle information such as GPS location and mileage will be available this year, and items will include AAA member services, Concur expense report tracking and Eventseeker, the last helping drivers to find nearby music and other entertainment. Other apps down the line include Cityseeker, which uses vehicle GPS data to showcase the best restaurants, nightlife and other attractions in more than 500 cities worldwide directly to the driver, as well as Tencent Chelian, where drivers can access China’s most popular social media platform, QQ’s messaging app, as well as music, real-time traffic conditions and streaming radio. The new tech hit will start off in North America on all 2017 vehicles equipped with SYNC 3, with the new Escape having been announced as being the first vehicle to roll it out. Owners of 2016 vehicles equipped with SYNC 3, meanwhile, will have an opportunity to upgrade later in the year, the company says. My Focus can update sync 3? not sync 3, but can update to additional feature, siri eyes free at service centre.